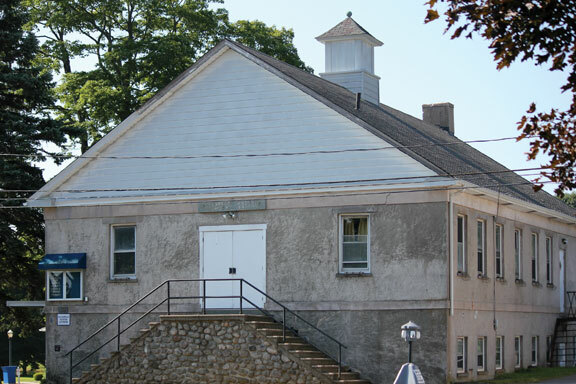 PROSPECT — Starting at the turn of the 20th century, the Prospect Grange Hall was the place to be in town. The building, which sits on Center Street facing the Town Green, was originally built in 1894 and rebuilt in the 1940s after it burned down. During its heyday, the Grange served as the center of the community. “Prospect, back in the 1800s and beginning of 1900s, was a farming community. Back then there were no cell phones, TVs or radios. The Grange was their form of entertainment,” Prospect Historical Society President Carol Brooks said. In addition to being a gathering place for communities across America, grange halls, which were part of the National Grange of the Order of Patrons of Husbandry, gave small communities the ability to lobby local, state and federal politicians, Brooks said. Until the 1970s, the Grange hosted an annual fair that included agricultural displays and music. Brooks said most of the displays, such as the fruit, vegetables and flowers, would be auctioned off in the evening. She said it was fun to watch people try to outbid each other for items Prospect residents grew. Due to the rising cost of the upkeep of the building, Brooks said the Prospect Grange transferred ownership of the building to the town in the mid-1990s. Time has taken its toll on the Grange. As the years passed, the building began to deteriorate, and the walls are starting to crack in places. “The building has begun showing its age,” Mayor Robert Chatfield said. After the town opened the Prospect Community Center at the former Community School across the street from the Grange in early 2017, all the activities held at the Grange were moved to the community center, and the Grange was closed. The water, heat and electricity have all been off for more than a year at the Grange, Chatfield said. Since the building is sitting empty, officials are discussing what the town can and should do with it, including possibly demolishing it. Demolishing the building would allow for a gazebo to be built in its place, since the town uses that area for its annual Concert on the Green series during the summer months, Chatfield said. There would also be space for picnic tables and a garden, he added. Demolition might prove to be a costly endeavor though. Like many older buildings, the floor tiles are likely attached by glue that contains asbestos, Chatfield said. The town would have to hire a company to remediate the asbestos, he said. Renovating the building could also prove costly. If the town were to repair the building, it would need to be brought into compliance with the Americans with Disabilities Act. In order to enter the building, a person either has to walk up the stairs to the first floor or down the stairs to the basement level, Chatfield said. The stairs from the basement to the first floor are so narrow in parts it requires turning sideways, and there are no ramps or elevators for people who are unable to use the stairs, he said. “There was no such thing as [Americans with Disabilities Act] when this building was built,” Chatfield said. Chatfield said he expects to begin discussing plans for the building in greater detail with the Town Council in November. Any decision the council makes would not be made lightly given the history of the building and how much effort the town has put into restoring the Grange Hall, Chatfield said. He pointed out that the town replaced the furnace, brought water lines to the area and installed a whole septic system when it took ownership of the building. Although there have been some discussions, the possible plans for the building’s future are still in the very early stages. “Nothing has yet to be decided,” Chatfield said.